Alan King is a jumps trainer who occasionally has flat runners. He has had success at the very highest level with winners at Cheltenham and Aintree, and was riding the crest of the wave in 2005-2008. Since then, King hasn’t had quite the success nor the high profile runners, but he still operates at a higher strike rate than the majority of trainers. In this article we dissect King’s runners across the different disciplines and under various conditions, identifying any patterns in his behaviour that can help make more informed betting decisions. King’s record with his newcomers to juvenile, maiden and novice hurdles depends on their previous experience. Contrastingly, King does well with his young hurdlers who transition straight from the flat to hurdling; 31/136 (23.53%) for £10.98 LSP, giving an A/E of 1.30. His runners who have had a run in a National Hunt bumper are 34/228 (14.91%) for a loss of £14.85, for an A/E of 1.10. It is clear that Alan King’s newcomers to hurdling are profitable on their debut over timber when they have previously had racecourse experience in another form. Ascot is one of the country’s premier racecourses, and it is a venue where King does extremely well, with his runners winning over 80% more often than they should do based on odds. He has yet to have a winner at Fakenham and Ffos Las. King’s quick returners do poorly. Those off for 3 weeks or less are 24/291 (8.25%) for loss of £-140.59, producing an A/E of 0.63. The only time his handicap hurdlers are profitable, is when they are returning from a 150+ day absence. King’s hurdlers do best from September-January. This makes sense as he does best with his runners off a long absence and the majority of his runners that meet that criteria will be returning at the start of the jumps season. From March-June, his record is abysmal; 29/555 (5.23%) for loss of £-326.07 A/E 0.47 and King’s handicap hurdlers should be avoided at this time. His runners should always be respected at Uttoxeter, Plumpton and Bangor-On-Dee, and although he doesn’t do terribly anywhere, he is yet to have a winner at Ayr from a limited number of runners. King’s handicap chasers do well under two sets of conditions; when off for 15-21 days, or when off for 57 days or longer. His handicap chase returners in November/December off for 120+ days do very well; 21/110 (19.09%) for £53.58 LSP, producing an A/E of 1.44. They clearly go well on their seasonal reappearance and have the fitness edge over their rivals. 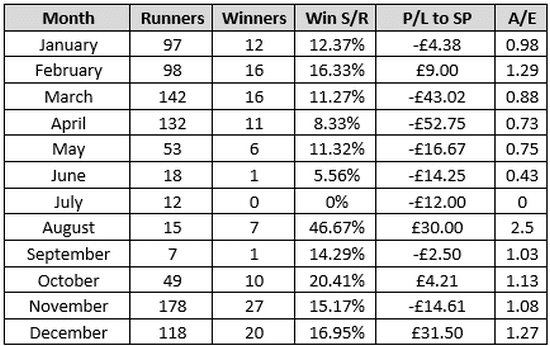 Alan King maintains a very solid strike rate with his bumper runners. 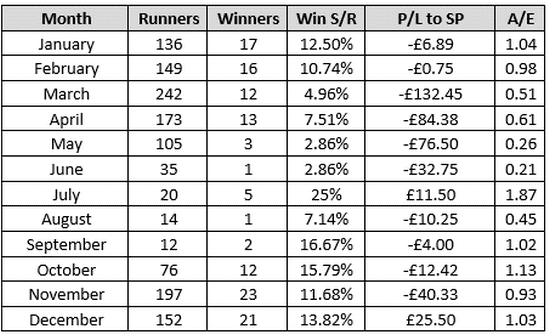 In the last 10 years, his runners are 52/269 (19.33%) for £60.35 LSP, giving an A/E of 1.35. They consistently outperform the market. King’s 3 and 4 year old bumper runners are the ones to follow. His 5 year olds tend to be over bet and produce a loss. King is prolific at Towcester, Exeter and Huntingdon with his bumper runners. Although primarily a jumps trainer, Alan King is not averse to having runners on the flat, and he does very well when there are no obstacles involved, particularly with his handicappers. King’s hurdling newcomers do best when they have had a previous run on the flat or in a bumper. He does very well with maiden, novice and juvenile hurdlers at Ascot. Alan King does poorly with handicap hurdlers off for 3 weeks or less. He doesn’t have a great record overall, but is profitable with his runners off for 150+ days. King’s handicap hurdlers do best from September-January. They do very poorly from March onwards. He does well with novice chasers, especially over the minimum distances of 2miles and 2miles 1 furlong. November-February is the time to catch his handicap chasers. His handicap chasers do well when off for 8+ weeks. Alan King does very well in bumpers, especially with his 3 and 4 year olds. His record is best at Towcester. His flat handicappers do best when off the track for 6+ weeks.